Packaging is what drives that choice. In the craft beer scene, an incredible 66% of consumers pick a beer based on its packaging or label. That’s because symbolic cues are crucial to driving purchasing habits – even more than features, benefits and price. High-performing packaging helps consumers make sense of the market and decide what to try. It tells consumers in an instant who you are, what you’re all about and why you’re the right choice for that next round. It’s smart, on-brand and drives preference. And it’s the one thing that category-dominating brands have in common. Here’s what that level of packaging can do for your craft alcohol or spirit brand. Everything that ships from your warehouse is made for someone. Your packaging must be strategically relevant to that audience to stand apart from the competition. But your ability to inspire your audience? That’s the difference between being on the might-try shortlist and the decision to buy. Attractive typefaces and eye-catching label design may be where good packaging design stops, but they’re where great packaging begins. Great packaging goes beyond stylish interpretation of the essentials to deliver insight into your methods, your values and your story. It elevates your brand by expressing your brand not just as a product, but as the clear choice. The result is a product with a reach far beyond your original target audience. After all, what would you rather pick up: a bottle, or an experience? Our branding and packaging for Sutlers Spirit Co is the latter. Stylish and surprising, it draws on the story of war-era merchant sutlers, while signaling premium cues with an opaque ceramic bottle design and a screen-printed label featuring metallic stenciling. Bold, unapologetic copy captures the spirit and ethos of Revolutionary-era sutlers. New and old ways collide with collateral including letterpress-printed calling cards and on-trend T-shirts. Opaque, corked bottles reference the ceramic vessels once used for housing gin. We worked closely with Sutler's Spirit Co. to help them develop a brand that blended audaciousness with subtlety – just like its historic namesakes. The packaging was inspired by the minimalist, inscrutable ceramic vessels used for housing gin during times past, and rebelling against the clear glass standards that fill the shelves. Check out more of this revolutionary era brand. Scot notes that his distinctively packaged gin also generates curiosity, inviting discussion that encourages people to give the product a try. Wine lovers were dismayed to learn that even expert oenophiles could be tricked into confusing a cheap wine for a fine vintage and vice versa. Here’s the thing: it’s not just about the taste. Taste matters, but it’s just an aspect of your craft beer, wine, spirit or cider brand. Your other senses are what round out the whole experience. They deliver the look and feel that shapes the ritual and experience of your product. There’s even science to back it up. Vision, sound and touch are key to the flavor experience, and all can be stirred by captivating packaging that positions itself as a feast for the senses. 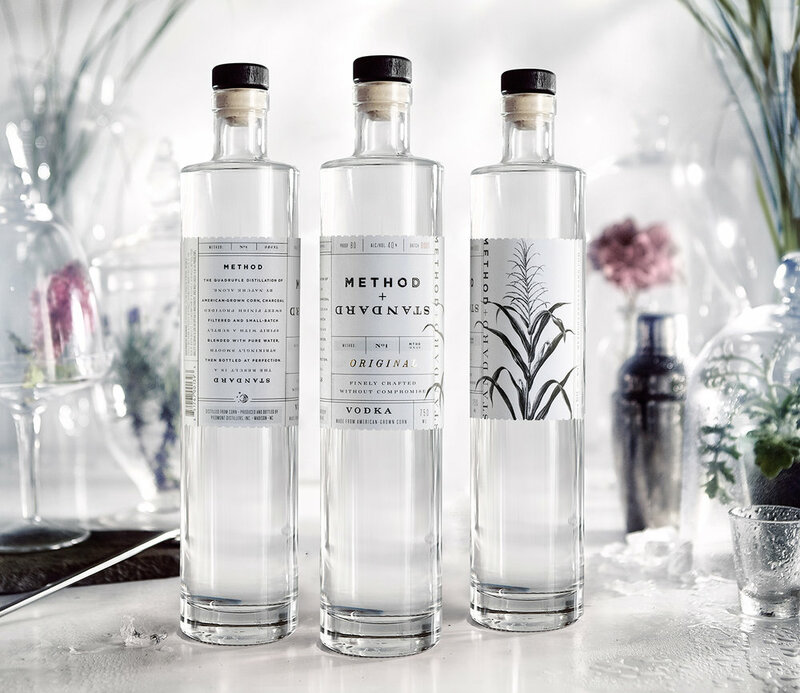 Take our packaging design for Method + Standard, a multi-sensory experience designed to resonate with a foodie audience that cares about what goes into their glass. Unadorned, clear bottles showcase the all-natural color of the fruit-infused vodka. Bottle swingtags expand the experience with tasting notes and house-created recipes. A two-way label gives consumers a differing perspective when viewing and pouring. Reminiscent of a premium olive oil, a strategically selected bottle connects the product back to nature. Hand-drawn fruit illustrations are deliberately shown on-branch to show that the spirit is made from fruit rather than a concentrate or extracts. During our research phase, we dug deep into the brand’s methodology, processes and philosophy to build an identity that encompassed naming, visual identity and packaging. The name, the feel of the paper, the foils, the placement and size of the label, the stature of the bottle and the artwork were all strategically designed to increase the perception of the quality of the spirit within – the method literally defines the standard. Ask someone to draw from memory the logos of the world’s most iconic brands, and the results won’t be great. That’s because we tend to only recall the “gist” of something. We recognize core elements, colors and patterns, and we use those to pick out a brand from a lineup of others. High-performing packaging design ensures those “gist” elements are distinct and memorable enough to trigger recollection even in newer consumers. It engages all the senses, features moments that invite extra consideration, and leverages the unexpected to reinforce brand recollection. For example, the main challenge of our recent packaging and identity design for Midnight Moon’s new whiskey product was to bring over the brand’s existing moonshine customers while also appealing to whiskey drinkers. To do so, we drew upon existing brand familiarity and recognition by retaining core design elements while also dialing up the premium cues that would resonate with the whiskey market. Foils and metallics, polished colors and premium paper give Midnight Moon Whiskey premium cachet. The shipper design reframes the bottle label for an experience that begins before the first pour. Tasting notes respond to the heightened expectations of the whiskey category. Branding and bottle shape were used to appeal to the brand’s loyal moonshine audience, while high-end papers, tasting notes and thoughtful copy delivered premium cachet to appeal to the whiskey audience. Joe frequently fields positive comments on the brand’s timeless packaging, as well as competitor efforts to trade on the power of the brand by using similar approaches. Being memorable isn’t a just feel-good outcome added to a brief to keep your designers happy. It can make all the difference in standing out in the increasingly crowded spirits, beer, wine and hard cider marketplace. You’ve put countless hours into developing your spirit. High-performing packaging will give it its best shot at succeeding in the market. BUILDING A BADASS CRAFT BEER, WINE OR SPIRIT BRAND? WE CAN HELP. Don’t let yours be a liquor that languishes on the shelf. Before you go to market, ensure it meets the threshold for high-performing packaging. Your bottom line will thank you. Scot from Sutlers credits his unconventional packaging design for getting distributors to pick up his gin. “The distribution game is difficult for the small guys. Having a unique look and feel is what got distributors to stand behind Sutler’s Gin. It’s been crucial to our success,” he says. Don’t be afraid to go against the grain. We live for elevating craft brands to bestseller status. So get in touch to see how we can take you from contender to crowd favorite.